Product is solid, fit on my FZ-09 good and looks great! 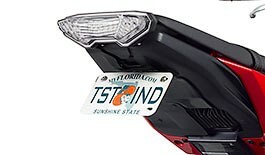 I attached the blinker kit offered on the site and it looks great! Advantages: Well built, slim profile, pretty easy to install. Disadvantages: It is an aftermarket part, so it will not be a 100 percent perfect fit when mounting. Excellent product and very fast delivery. I received my order in three days. The installation was completely trouble-free, it took me about an hour to install the complete kit, rear fender eliminator w/led tail light, front flush mount signals, and flasher relay. This product is super easy to install, thanks to being completely "plug and play". This is why I ordered this kit over all the others out there, and it works perfectly! The LED tail light is super bright, which is a plus. Blinkers are also very bright. Advantages: Eliminates the huge, ugly mud flap thing and plate holder. Eliminates protruding turn signals. Very, very easy to install! Works as advertised, and fit and finish is perfect. The entire kit (front signals, tail light, flasher relay) is exceptionally light weight. This is a big advantage on a dual sport bike. Also it makes your bike look so much better. The guys at TST have put together a great product that definitely enhances your dual sporting experience. quality product, nice finish, went with the fixed low mount. Disadvantages: not having turn signal mounts incorporated into the design making it one unit.